Smart, stylish, and voraciously interested in the world, Vanity Fair readers have an extraordinary ability to discern what is truly worth their time, attention, and money. It is essential for Vanity Fair readers to be conversant in a wide range of topics?from global issues, economics, and travel, to beauty, fashion, and entertainment?and they pursue the knowledge of these subjects with an unusual intensity. Vanity Fair readers actively seek out friends and colleagues with whom they share ideas and experiences, creating a diverse and eclectic network of peers. Known for its ability to "ignite a dinner party at 50 yards," Vanity Fair is meant for readers who enjoy expert-level knowledge and lively, spirited debate. Fanfair: Vanity Fair?s monthly guide to truly unique and talked-about cultural events around the world, hot new CD?s, books, and films; groundbreaking art and design; exhibitions and theatrical events; fashion, beauty, and travel trends. Fairground: The magazine brings its discriminating eye into the world?s most exclusive events, capturing candid snapshots of the culture?s rich, famous, and iconic. This pictorial feature goes around the world, one party at a time. Vanities: Short takes on today?s most compelling personalities, Vanities is a reader favorite, incorporating splashy graphics and quick wit. 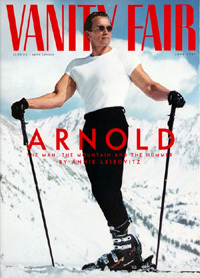 With every issue, Vanity Fair allows its contributors the freedom to indulge in extraordinary storytelling, making it a destination for the world?s most renowned photographers and award-winning journalists, such as Marie Brenner, Bryan Burrough, Bob Colacello, Amy Fine Collins, Dominick Dunne, Christopher Hitchens, Sebastian Junger, William Langewiesche, Maureen Orth, Todd Purdum, James Wolcott, and Michael Wolff; and photographers such as Jonathan Becker, Harry Benson, Patrick Demarchelier, Todd Eberle, Larry Fink, Jonas Karlsson, Annie Leibovitz, Tim Hetherington, Norman Jean Roy, Mark Seliger, Mario Testino, and Bruce Weber. With a broad range of interesting subjects, Vanity Fair is a general interest magazine that captures the best of the best, from world affairs to entertainment, business to style, design to society. Vanity Fair is unique in its ability to act as a cultural catalyst?a magazine that provokes and drives the popular dialogue. No other magazine can match Vanity Fair's unique mix of stunning photography, in-depth reportage, and social commentary. Each month, Vanity Fair accelerates ideas and images to center stage, creating an unrivaled media event that attracts millions of modern, sophisticated readers. Vanity Fair's advertisers are as eclectic as the editorial content. Fashion and retail advertisers are responsible for the majority of Vanity Fair's ad pages, but other advertising partners stem from a wide array of consumer categories, including automotive, financial institutions, not-for-profits, corporate entities, beauty, travel, entertainment/media, home furnishings, food, and wine and spirits. On average, a little more than half of the pages in Vanity Fair are devoted to advertising (56%). Ordered my wife a subscription last christmas. Recieved 2 issues, never got the rest of them. I'll never order magazines through Amazon again. Don't be fooled by the pretty faces on the cover. This is one of the savviest newsmagazines around. Read it and love it for the crackling writing, the grown-up humor, and the inside story. Then treat yourself to the dish about the sins of the rich (who are usually NOT the people in the tabloids, but mysterious financiers who live offshore and have dark and shady pasts...) and a brief interview with the cover celeb. It's one of the best monthlies available. About two years ago, Vanity Fair was not only the best magazine of the year, but maybe all time. I would read it from cover to cover. People Plus Equals 3 Stars. This is a magazine for those enthralled with celebrities. Without the fine writing of Christopher Hitchens I rarely would read it. The last article I enjoyed was on the eccentric Howard Hughes. I like the high quality photos, but it is basically a deeper version of "People." It has the same shallow slant that overglamorizes celebrities, luxury, consumption, & encourages narcicism. Why they have to have articles on advertising when two-thirds of the mag are ads is overkill? The first forty pages are ads, then you reach the contents page. I don't normally like glossy magazines that think too much of themselves, I think that they were invented to be dumped on coffee tables to look good when you have visitors around for coffee but if you want a really good and intelligent read, buy TIME or Newsweek. However I will make an exception in the case of Vanity Fair, I actually subscribe to it which came about after I read a really good article in it about racism. I was quite impressed, it was well written and quite unbiased, rare in a magazine that is known for its skinny models/actors/musicians who lounge elegantly as they give interviews whilst looking the camera and say in hot sultry voices, "Darling, I'm an artist, it's my passion, my love, that's why I do it!" I won't say that Vanity Fair has given me too much food for thought but it has been enough for me to take out a year's subscription to see if they can come up with anything else that is remotely intelligent and thoughtful and they haven't done too badly up to now.